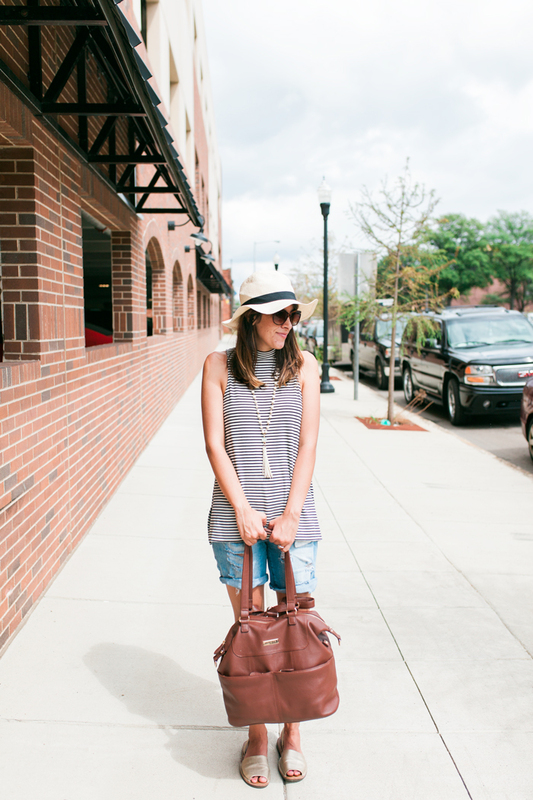 Transitioning my current wardrobe into fall is always something I struggle with. It’s hot one day, it’s cool the next, or its hot in the morning and then by lunch it feels like summer again. Sound familiar? How are you supposed to dress for that? It also feels weird wearing white- even though I still do it, ha! Breaking all the southern rules! What I have been doing lately is pairing simple pieces from summer and putting a light fall top or shorts with it. For instance, I bought this olive woven tunic and it’s perfect to pair with shorts and the top is light enough to wear all day even when it is hot. Once labor day passes I get that fall fever where I just want to pull out all my booties and scarves and call it Fall on the spot! Living in the south though, I’ll have to wait til mid October at the least to even feel comfortable wearing boots and scarves! 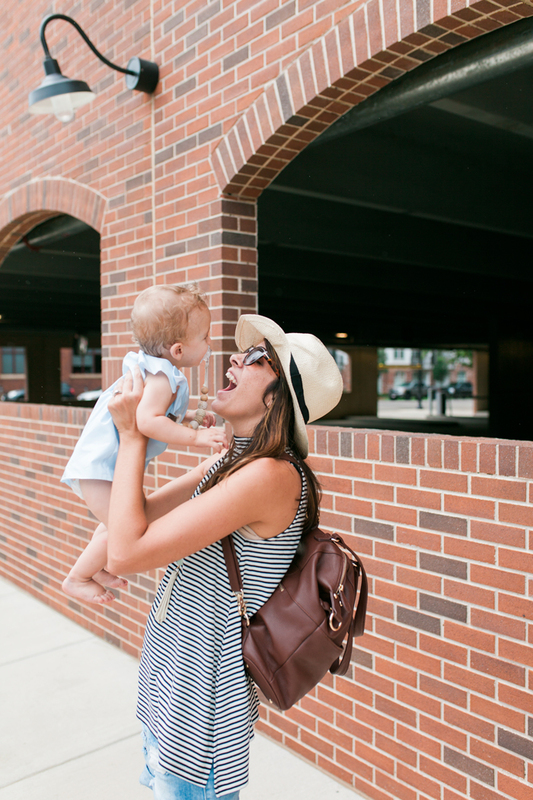 You may have noticed my chic and super stylish diaper bag! Yes, that is a diaper bag!!! Isn’t it gorgeous? Lily Jade makes some beautiful bags, mamas! I had such a hard time choosing a bag. When I welcome my second baby, I knew there was no time for a cute over the shoulder bag. I needed a backpack or a bag that turned into a backpack to allow me to be hands free. Moms really don’t have enough arms, and it is so hard to run errands when you have TWO kids! Lily Jade makes it easy, because i can carry it as a bag and within seconds turn it into a backpack if I need to. It’s amazing! And, the inside!! It comes with a removable organizer insert that you can stash so many items in. I have enough room for diapers, wipes, snacks, pull ups, undies, bottles, swaddle blanket, nursing cover, toys, sippy cups, my wallet, and much more! It has so many pockets there is a spot for everything! In these photos we packed up and headed out to Trucks on the Tracks here in Birmingham, and I was able to squeeze lunches and all of the rest I stated in the bag. It made our day trip so much easier. I’ve done the backpack for each kid thing before and it just didn’t last long. I found myself carrying their bags plus my bag. That’s too many items and not enough arms! If you’ve been thinking about a Lily Jade, I can honestly tell you that they are incredible bags that are so luxurious at the same time. I feel like I didn’t have to give up my sense of style when I chose a Lily Jade and that is huge! I was gifted a bag of my choice from Lily Jade, but all opinions and words are my own 🙂 I only accept products from brands that my family and I would wear and use on a daily basis! That is such a beautiful bag! Stylish AND functional? Sign me up! Y’all are the cutest! This is always a struggle for me too! But these key pieces are perfect! 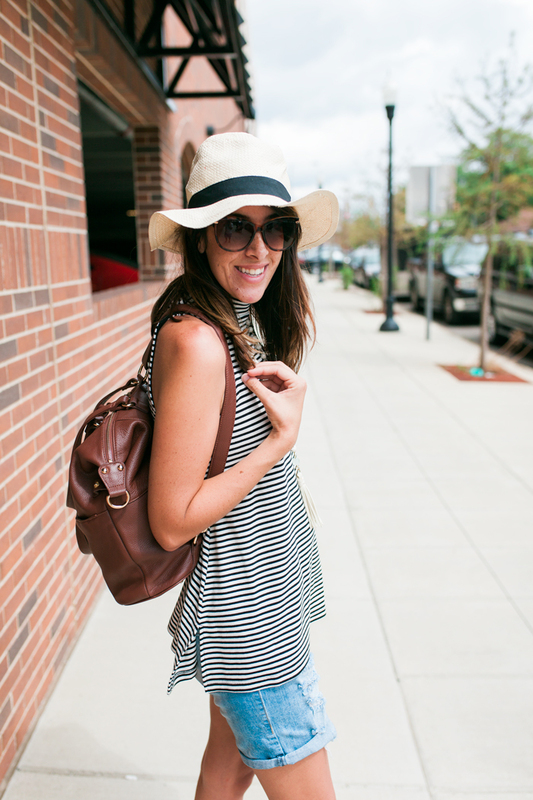 Love your stripe top and backpack!! Cute look! These days between summer & fall are crazy in KY too! This look is perfect for those days though. And that’s a diaper bag?! SO cute! 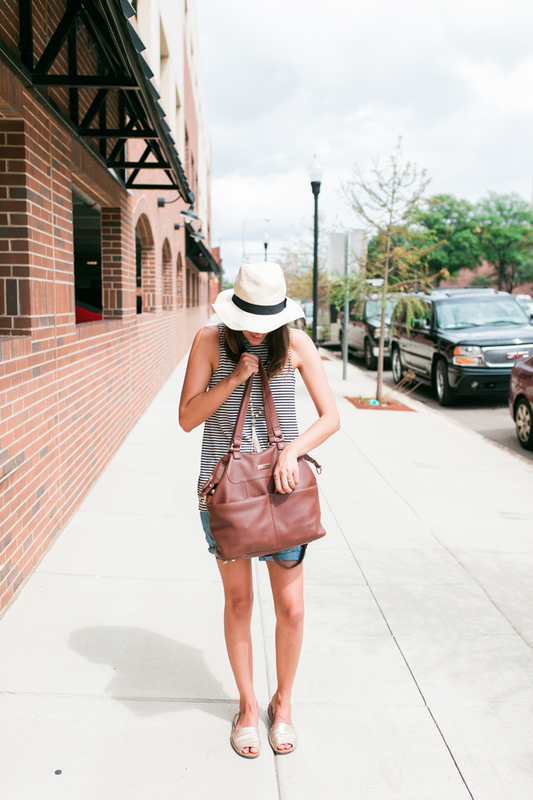 Such a cute relaxed look and I love those shoes! 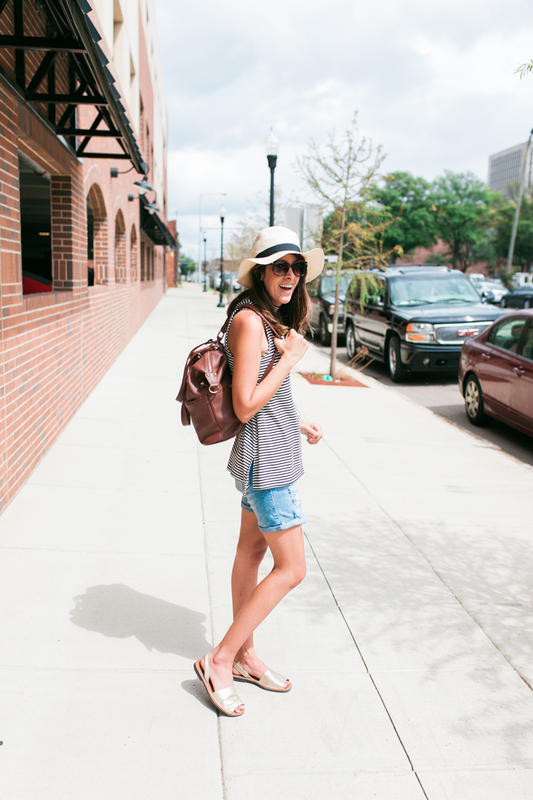 Love your backpack! 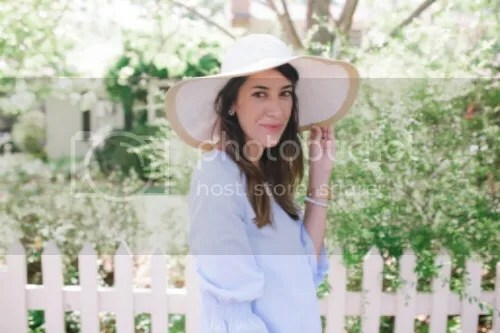 This is such a cute look!!! Thanks for sharing! That bag is so awesome! 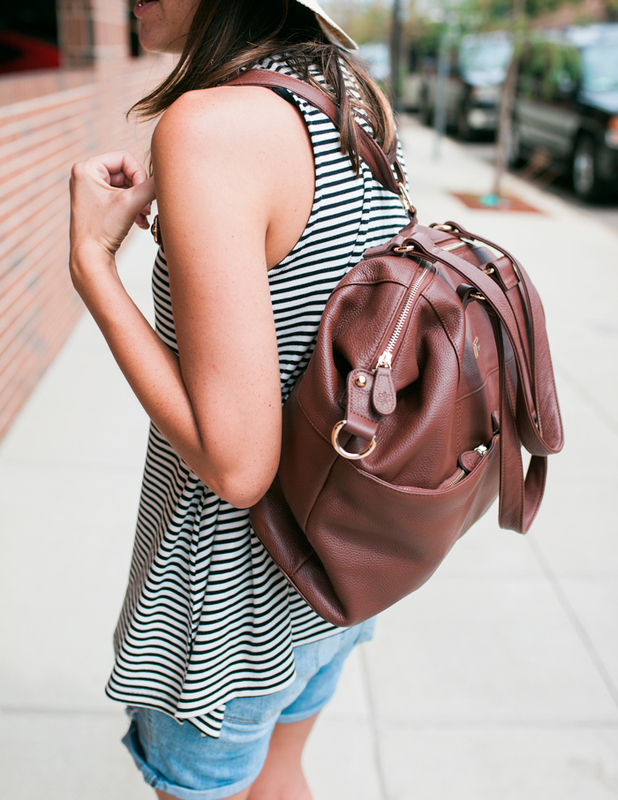 I love that it can convert from a regular purse to a backpack. 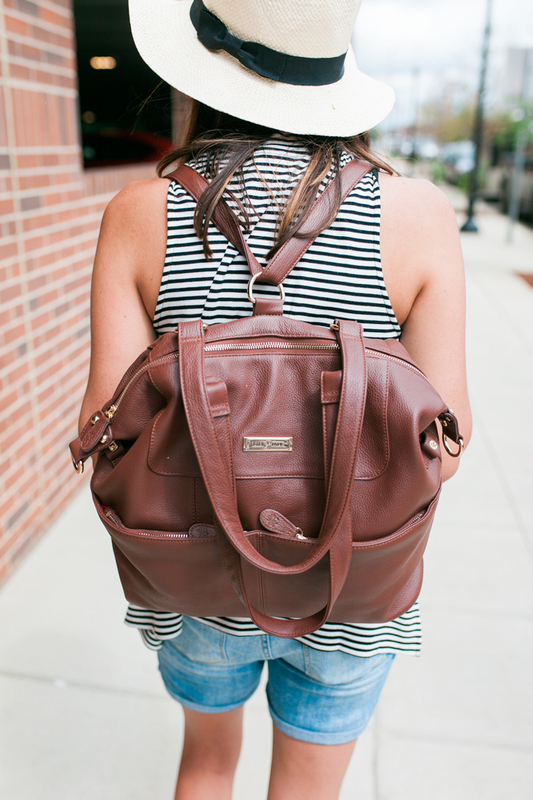 Backpacks are so in right now! 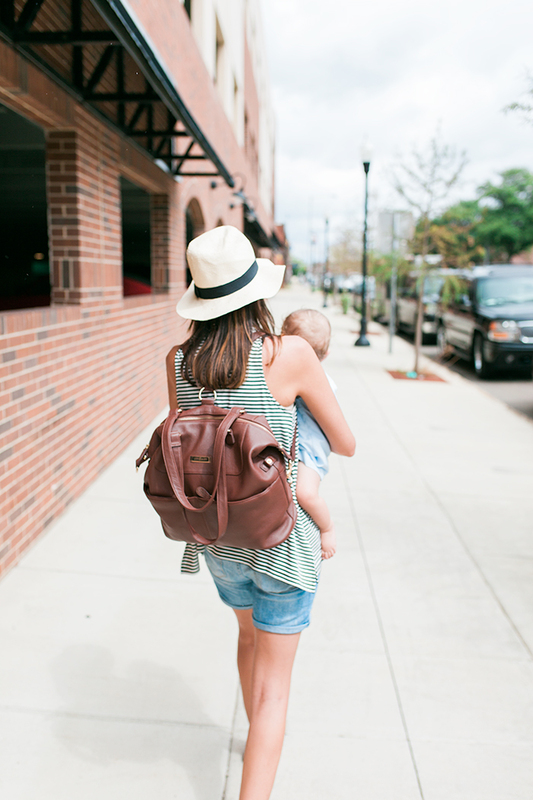 Lily Jade makes the best diaper bags! I don’t know what I would do without mine – and now I want this one too! Such a cute diaper bag for momma’s! 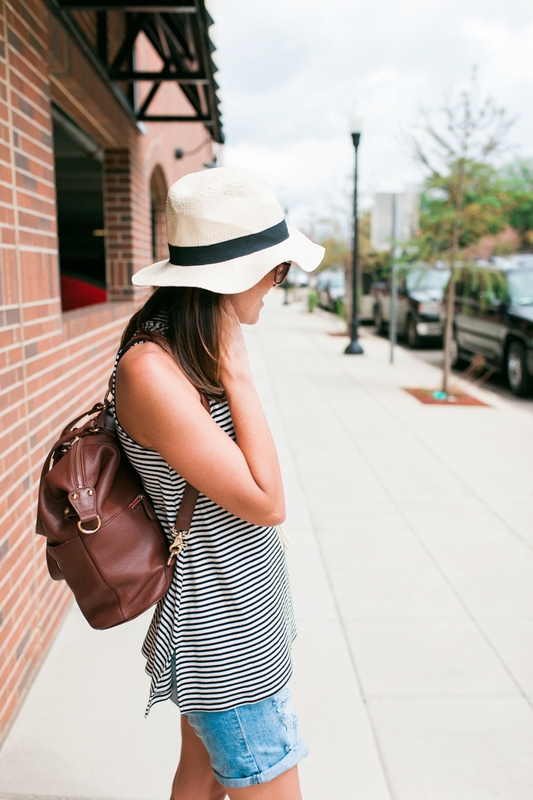 That looks way too stylish to be a diaper bag girlfriends! Need to check this handbag line out! I’m in LOVE with lily jade, I have more of their bags than I’d like to admit! oh i soooo need a backpack diaper bag!! i have been thinking about that so much lately. the one shoulder thing with a bag full is the worst!! and you are looking beautiful my friend!! i looove this whole ensemble! I want this ENTIRE look! Including the diaper bag!